In an effort to make this blog more than just weekly NFL picks, I am going to step out of my comfort zone . I am going to take a look at the New England Patriots through the first four weeks of their 2013-2014 campaign. The biggest reason for the defensive success has been Aqib Talib. 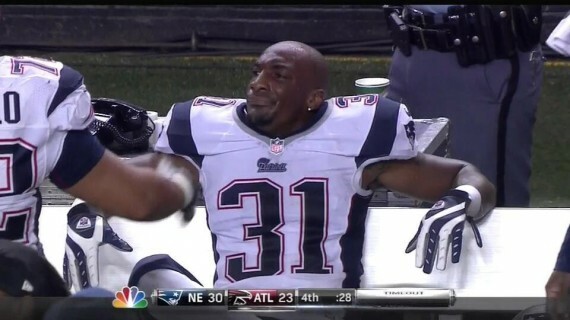 Talib is the first true shut down corner I can remember the Patriots having since Ty Law. Talib’s coverage of Julio Jones on Sunday night was masterful throughout the game. On Atlanta’s last chance, he batted the ball away from Roddy White in the corner of the end zone. Over the last several years, the Patriots cornerback would’ve been beaten like a drum and the Falcons would have tied the game. Not with Talib on the field. Talib’s off the field troubles are well documented. Off field problems are a particularly sensitive subject in New England nowadays. From a public relations perspective, they have to tread lightly with Talib. Be that as it may, I believe re-signing Talib as soon as possible is in their best interests. I was stunned when he decided to come back to New England over the summer on a 1 year deal for $5 million. Cornerbacks that can shut down opposing receivers are at premium in today’s NFL. The Patriots have one of the best in the business. They need to evolve from “The Patriot Way” and pay the man. Speaking of paying the man, I have to wonder if Rob Gronkowski would be back on the field by now if he hadn’t of signed the 6 year $54 million extension back in June of 2012. Why Rob Gronkowski does not receive an iota of the criticism Jacoby Ellsbury receives in this region is beyond comprehension. The scoreboard says Jacoby has a championship ring and Gronk does not. The scoreboard says Ellsbury and Gronk are real life versions of Samuel L Jackson’s character in Unbreakable. I feel that since the Patriots signed both tight ends to long-term deals, the young men repaid them with reckless behavior. Gronk has his money and will play when he wants to. I can’t appreciate that out of Gronk as fan. At the same time, I will risk speaking out of both sides of my mouth. The Patriots have been fine without Gronk through the first four games of the season. Given the choice, I’d rather have Gronk healthy for the playoffs than the beginning of the season. Lastly, I would like to speak to the genius of the coach, Bill Belichick. Belichick introduced the hurry up, no huddle, fast break style offense to the NFL. Many teams have now employed that strategy to the point where it is now the norm in the NFL. Belichick has already gotten away from that strategy out of necessity and also to defend it. Many wondered why the Patriots were carrying four running backs coming into the season. The answer is now clear. Stevan Ridley, Shane Vereen, LaGarrette Blount, and Brandon Bolden are all work horse backs that can fight for tough yardage. They all can get at least 4 yards in a carry which is all you need in football to get a first down. Taking the air out of the football is Belichick’s way of defending the fast break offense. Adding the ground and pound element to a stout defense is a recipe for winning football games. It also does hurt the Patriots that the greatest quarterback of all time is under center. And it doesn’t matter who is receiving corps is.